Here at Financial Panther, we’re all about looking for weird money making opportunities. And if we can make a little bit of extra money while doing something we’re already doing, all the better! That’s why when I received the below email from Postmates, I immediately started figuring what I could do to snag that referral bonus. As some of you already know, I’m a big fan of on-demand delivery services. I’ve written in a previous post about how I get paid to bike around town in my spare time using Postmates. The good thing about on-demand bike messenger delivery is that all you need to get started is a bike and a smartphone. You don’t need to worry about putting miles on your car, buying gas, or figuring out insurance stuff. You can also literally work any time you feel like it. Just turn on the app and log in. If you don’t want to work, just turn the app off. Plus, being a bike messenger is probably one of the only ways you can get paid to exercise. A $450 bonus simply to refer someone to Postmates is a good chunk of change. But how would I go about getting that money? The first thing I needed to do was find someone who I could refer to Postmates. Ms. FP was the obvious choice in my world. She’s always found my love of Postmates sort of amusing, but mainly eye-rolling. Sure, it’s a fun little thing for me to do on the side, but ultimately, she thinks it’s pretty dumb. For sure, she’d never sign up to make deliveries. I have a way with words though, so, after making my case, I managed to convince her to sign up using my referral link. The only promise I had to make was to do the deliveries with her. That’s not so bad a thing to do. It was October when Ms. FP signed up for Postmates and the weather here in Minnesota was still great. We see couples biking around the city for free. Why not get paid to do it too? The process was even easier as compared to when I signed up for Postmates a year ago. Instead of having to attend a 1 hour on-boarding session, the entire sign up process took place online. All we had to do was enter in Ms. FP’s information, watch a short video, and then answer a few multiple choice questions at the end of the video. It took us less than 15 minutes to sign up. After signing up, we had to wait for Postmates to complete a background check and mail her a Pex card and delivery bag. The materials arrived about a week later. With our all our stuff in hand, Ms. FP and I grabbed our helmets and hopped onto the closest bikeshare bike. How Much Could We Make? In order to qualify for the $500 bonus, the person I referred needed to do 30 deliveries within 30 days. That’s a measly 1 delivery per day. Of course, we didn’t want to chance it with these referral bonuses, so we figured our best bet was to get this done as fast as possible. I normally see about $8 per delivery, so I estimated that we could bring in about $240 for the 30 deliveries. Not a ton of money in itself, but not bad considering you’re getting the double benefit of exercising and improving your health. I also estimated that we could get through 30 deliveries in about 15 hours. I’ve been doing Postmates for over a year now, and typically, one delivery takes me about 30 minutes or so. If you’re lucky enough to get a bunch of quick deliveries in a row, you can snag 3 in an hour, but 2 per hour is the more reasonable estimate. $740 for 15 hours of work comes out to a solid $49 per hour. That’s good for $98,000 per year. Most people would scoff at this being a waste of time, but if you have an opportunity to make that type of money while exercising, why wouldn’t you give it a shot? Turns out we made more than I expected. Take a look at the below earnings reports from Ms. FP’s dashboard. We ended up doing 31 deliveries just for good measure. All in all, it took us about 15 hours to complete the deliveries, which we did over the course of a week. And here’s the $450 referral bonus on my own dashboard. The $450 I earned plus the $348.27 that Ms. FP earned brings our total earnings to $798.27 for 15 hours of work. That comes out to $53.21 per hour, or the equivalent of $106,436 in a year. That’s more than what I make in my current job! What accounted for the higher amount that we earned? It’s pretty simple. Postmates offers incentive bonuses during periods of high demand, typically around dinner or lunch time. We just happened to do our deliveries mainly during periods where Postmates was on blitz pricing, plus offering an extra $2 or $3 per job. Postmates is always sending me these type of text messages. Okay, I can already hear the naysayers jumping out of the woodwork to tell me that this type of income isn’t sustainable. Not to mention that this bonus is split between two people. If that’s what you’re thinking, then you’re missing the point of this post. This isn’t about building a sustainable $50 an hour business as a delivery person. (Although it could potentially be possible if you’re able to build up a huge referral base – so shameless plug, why not sign up for Postmates using my affiliate link). For me, the point of this post is to pay attention to what’s out there. Figure out what you like to do and see if you can earn money doing it. Ms. FP and I both like biking and spending time together. Postmates gave us an opportunity to do both of those things and get paid $800 to boot! That’s the same amount a person making $40,000 per year brings in per week. Not so bad. There are a lot of ways to make money. Anyone who thinks they can’t make some side money is kidding themselves. We live in the golden age of side hustling. Anyone who wants to make extra money can do it. The great thing is that you don’t have to commit to anything. You don’t have to spend a lot of time or money starting up a side hustle like you would have had to in the past. With the sharing economy, you can sign up and work anytime you want. There’s never been a moment in history where you could make money like you can today. Think outside the box. A lot of people who know me laugh at the fact that I work as a delivery man on the side. They see it as a waste of my time. I see it differently. For me, being able to make deliveries on my own time is not only fun, but is also an easy way for me to get some exercise into my day. Everyone needs to take some time out of their day to get some physical activity in. The financial benefits of that alone are of some value. If you can get paid to exercise, that’s even better. Take action. 99% of people will see an email like this and simply ignore it. It’s too much work, takes too much time, whatever. I know that I’ve offered to split the referral fee with friends of mine who enjoy biking, but no one will take me up on it. Even with splitting the referral, anyone I referred would make about $34 per hour. That’s a good amount of money to get paid to bike and enjoy the outdoors. People want to make money, I’m pretty sure of that. They just don’t want to do it in ways that seem weird. After this successful experience, I’m going to see if there are any other referral bonuses out there. Doordash recently offered a similar bonus, but requires 50 deliveries in order to earn the bonus. We didn’t have the time for that. However, I did recently sign up to deliver for Uber Eats and while the pay for it is horrendous, they do have a $100 referral bonus that only requires 10 deliveries to earn. I may see if we can snag that bonus. Remember, think outside the box. There’s a lot of money out there if you’re willing to be weird. Haha. This is awesome. I’m surprised they don’t have exceptions for referring someone at the same address. Is Mrs. FP going to keep doing it or did she start rolling her eyes again? Do you have to use a bike for this? Or do people do these deliveries in cars / by walking too? Oh she’s definitely not going to do anymore. We just did it so we could get the referral bonus. You can use any vehicle you want, but I prefer to use bike because the main value I see from doing this type of gig is getting the exercise. Probably 95% of people deliver with car though. You should definitely do some Postmates while you’re doing your road trip. The good thing is that you can do deliveries in any city that has Postmates. You’ll just need to sign up in your home market, but then once you’re signed up, you can turn it on in any city that has Postmates. When you open the app up, you can actually see every market that Postmates operates in. Would be interesting if someone did 1 delivery in every city. I’m not sure if Uber Eats or DoorDash allow you to work in any city, but might be worth checking those out as well. I think I have a referral link in the post, but shoot me an email if you have any questions. I do like experimenting with these weird side gigs. The good thing is they don’t take much time to sign up for and have no commitment. Bike faster, make even more! The referral bonus won’t always be there, but the fact that you can earn money while getting exercise is a win / win. Now if you had Mr. 1500’s electric bicycle, you might lose a little on the exercise side, but at 40 mph, you could certainly squeeze in a few more drop-offs. Oh yeah, an electric bike would be pretty sweet. There’s a guy on youtube who films himself doing deliveries and he recently snagged himself one of those electric bikes. He just zooms up hills. Love it! I definitely wouldn’t scoff at an extra $800 in my pocket for 15 hours of work! I think it’s great that Ms. FP played along. Thanks for sharing. That’s the great thing about her. As soon as I asked to do it, she knew I was trying to get her to do it in order to blog about it later. She’s a good sport though and actually had fun with it. That’s pretty amazing, Panther. Congrats to you and the missus for hitting such a high hourly rate…and grabbing some great cardio while at it! Ain’t nothing shabby about $50/hour…no scoffing here! Thanks FL. It was a fun little experience just to see what it’s like to snag those bonuses. These bonuses won’t be around forever, so not a bad idea to snag em while they’re here! Lot of ways out there to make some money! Obviously, $50 an hour to bike around isn’t a normal thing, but hope people can at least see there are ways out there if you’re paying attention and willing to try. I agree there has never been a better time to start a side hustle. It’s never been easy and the options have never been this plentiful. They truly cater to every skill, talent, and schedule! That $450 referral is killer. That’s essentially the same you’d get at my work for referring someone who lands a job (it’s only $50 more). Awesome referral and even if you only referred 1 or 2 people it would be well worth promoting. My firm had a similar referral bonus ($500). If these delivery apps can afford to give these bonuses out, my only guess is that they aren’t forced to pay them out all that often. A lot of people won’t both just because it seems beneath them or they don’t want to take action. Also, I need to go pick up a copy of your book sometime David. This post got me excited! I work downtown in my city and could probably stay late 3 days a week to earn this bonus biking around like you do. That $450 is a nice bonus (ill be sure to sign up through your link if I do). If I do that I might try the UberEats bonus as well. $550 for 40 deliverys sounds doable for me! Definitely seems like an easy thing you could do. One thing to note is that I have no idea if that $450 referral bonus is still going on. 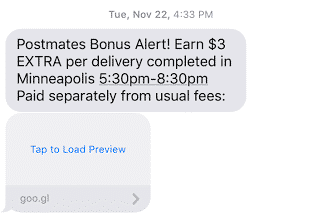 Postmates doesn’t really have any set referral bonuses, and whatever they give is pretty random. The reason we jumped on the referral was because I received an email from Postmates for the month of October. I know the Uber Eats referral seems pretty universal. Even without the referral, I still think it’s worth signing up just to see if it’s for you.